I wanted this column to be a departure from my previous efforts that explored the wonkier side of fish—from the end of overfishing to the subsequent rise of underfishing. They’re topics only a true fish-head could love. In addition to digging into the deeper mysteries of fisheries policy, Fish on Fridays should be about bringing new interested folks into the fold, catering to those with a passing interest, and hopefully raising the bar of piscine perceptions for Red Lobster lovers and the Starkist crowd. But then Congress got into the act. The Department of Defense and Full-Year Continuing Appropriations Act, to be precise. While most of the high-profile policy language, referred to as “riders,” was eliminated from the full-year spending bill passed earlier this month, a fisheries rider found its way in. It’s not as emotionally charged as the ultimately rejected Planned Parenthood rider or as ignorant and short-sighted as the House-passed “defund the EPA” rider. This one would prevent federal funds from being used to approve new catch share systems (more on these in a minute), which in some cases have proven effective in managing our nation’s fisheries. Reps. Walter Jones (R-NC) and Barney Frank (D-MA) initially introduced an amendment to the first House-passed continuing resolution back in February. This amendment would have prevented any federal funds from being used to develop or approve new catch share systems in four of the United States’s eight fishery management regions (New England, the mid-Atlantic, the south Atlantic, and the Gulf of Mexico). Federally funded fishery management councils comprised of federal and state regulators, industry members, and other stakeholders like environmental groups develop all fishery management plans that are then approved by the National Oceanic and Atmospheric Administration, or NOAA. Reps. Jones and Frank felt that catch share systems were proving harmful to fishermen and ultimately inflicting undue economic hardship on coastal communities. After the spending bills ground their way through the sausage-making process, the end result of their efforts can be found in Section 1349 of the ultimately enacted full-year continuing resolution, H.R. 1473. It prevents any federal funds from being used to approve new catch share management systems. What ultimately passed into law is a good deal less restrictive than its original iteration in that it allows managers to continue working on catch share plans but simply precludes their ultimate approval. NOAA has developed an intricate legal analysis that details how this provision will be implemented. Ultimately, Congress’s move to break with tradition and legislate specific action on the part of fishery management councils has raised legitimate concerns about future fisheries management. So instead of a breakdown of what’s inside the breading of your Filet o’ Fish—stay tuned for that one—we’re going to talk about catch shares. In its most simplistic form, a “catch share” management system is one in which the total allowable catch of a given fish stock is divided up into quota shares and distributed annually to fishermen who can then catch those fish more or less how and when they see fit. Catch share systems are often touted as a solution to the problem of “derby fisheries” or “the race for fish.” This problem arises when fishermen used to unfettered access to a fishery resource are faced with an overall harvest limit but no set means of partitioning up the fish. So the season opens and everyone rushes out to catch as much as he can as fast as possbile before the next guy beats him to it. The Alaska halibut fishery is often used as an example of the benefits of catch share management. Before the current system was implemented in 1995 the fishing season had shrunk from the originally intended eight months down to as little as two chaotic days. Effectively, the clock would start at midnight on day one, and the entire fleet would charge out to sea, fish until their boats were loaded down beyond capacity, race back to the docks to offload, and get back out as quickly as possible until the year’s quota of fish were landed. A derby fishery completely disregards safety—if the weather happens to be bad on the season’s opening day, captains will take risks because if they don’t go, someone else surely will. It also ignores environmental factors—the fishing grounds closest to shore are frequently hit hardest by fisherman’s efforts to reduce the time spent steaming to and from port. And it completely fails to account for the law of supply and demand, bringing enough to market for the entire year in just a few days. Under a catch share system, fishermen are given a set amount to catch over the course of the season. In most cases they are also given the option of either catching their quota or trading it to someone else. No more racing. No more hammering proximate fishing grounds. No more pressure to fish in bad weather or with overloaded boats. And no more flooding the market. Consumers win, too. Instead of fresh Alasaka halibut for two days we now get it for eight months. So why the brouhaha over catch shares? Well, what I have described is a best-case scenario. Often these systems come with more questions than answers: First and foremost is the dilemma of initial allocation. How do you decide who gets how many fish? Typically, initial allocation is based in some form on a permit-holder’s catch history. But for what period of time? 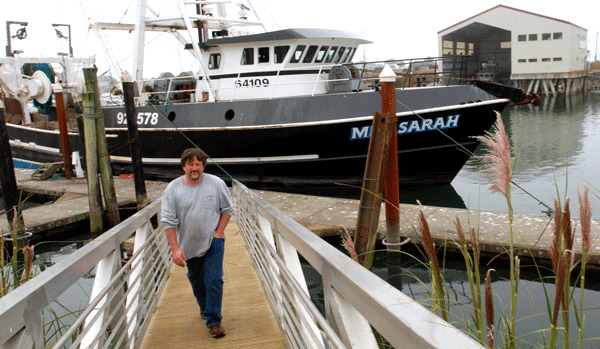 How do managers weigh the needs of commercial fishermen versus recreational fishermen? And what about fishermen who trade efficiency for more environmentally friendly gear and a higher-value product? If they caught less historically in order to sell a better product at a premium, how do you account for that in an allocation battle? What about tangentially related fisheries? In the northeast scallop fishery, for example, yellowtail flounder isn’t the target fish but is sometimes caught in scallop dredges. So the scallop fishery needs a separate allocation for their unintended harvest—called “bycatch”—of flounder. How much should they get? There are also concerns about consolidation. Should there be caps on the percentage of fish one fisherman can control? Will nonfishing entities such as banks be allowed by the regulations to purchase a quota and lease it out it to the highest bidder? And what about the needs of fishing communities? In such a limited access system what happens if fishermen decide to take advantage of economies of scale and concentrate effort in large ports to the detriment of smaller coastal towns? To an extent, these questions can and must be addressed by the Fishery Management Councils tasked with developing and approving fishery management plans. But these decisions inevitably result in winners and losers. And those who end up with the short end of the stick look for remediation any way they can, particularly when our science-based management system is struggling to support management. Those who lose call their elected representatives. And this brings us back to Congress. Congress has typically stayed out of decisions about management in particular fisheries, leaving that task to the regional Fishery Management Councils, as the Magnuson-Stevens Act stipulates. But the inclusion of the Jones Amendment is troubling because it sets the precedent that Congress is willing to legislate what methods of fishery management are available to the councils. The Jones Amendment will expire along with the rest of the spending bill on September 30 of this year. But once policy riders are enacted they have a way of sticking around. The moratorium on new offshore oil and gas drilling that was allowed by Congress to expire in 2008, for example, had been in place for 26 years. While catch share management is not a panacea that will save every fishery, it has been proven in some case to be a valuable tool that works for fishermen and fish populations. According to NOAA’s statistics, in 1994, the year before the Alaska halibut catch share system was put in place, the harvest was worth $93 million. This is about $133 million when adjusted for inflation to 2008, by which time the value had increased to $217 million while the overall amount of fish caught was effectively equal. This is likely one reason why Pacific fisheries are not covered by the Jones Amendment’s prohibition on catch share approvals. West Coast fishermen have seen the value a well-designed, well-executed catch share system can provide to their industry and their communities. Congress and our fishery managers should be looking for more tools, not less, to help them achieve the long-term goal of bringing our nation’s fisheries back to a state of long-term sustainability. Preventing fishermen from potentially benefiting from a system that has proven successful in the past is no way to ensure a successful future.